A few months ago I reviewed the Scosche MagicMount Pro Charge. It is a wireless car charger that holds your phone in place via magnets. I not only love it, but I use it every single day. The same magic is available for your desk thanks to the indoor version of the Scosche MagicMount Pro Charge. The $69.99 Scosche MagicMount Pro Charge is a Qi Wireless charging magnetic mount for both home and office use. 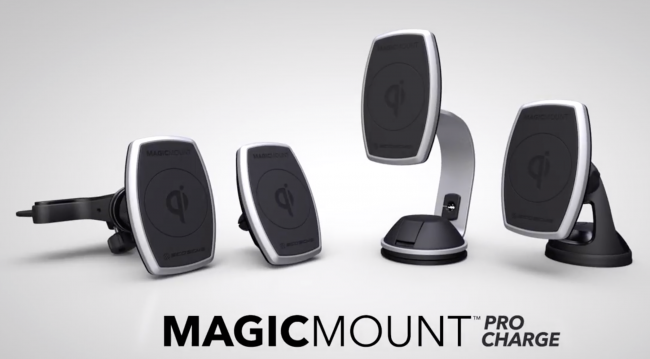 The MagicMount Pro Charge uses the same Qi wireless charger as the MagicMount Pro I reviewed. It delivers up to 10W of Qi Certified wireless charging power and is both Apple and Samsung Fast Charge Compatible. It has “foreign object detection” so the charger won’t attempt to send power to items that are not Qi-equipped, even when they are set on top of it. That’s a fantastic safety measure that all Qi wireless chargers should have. 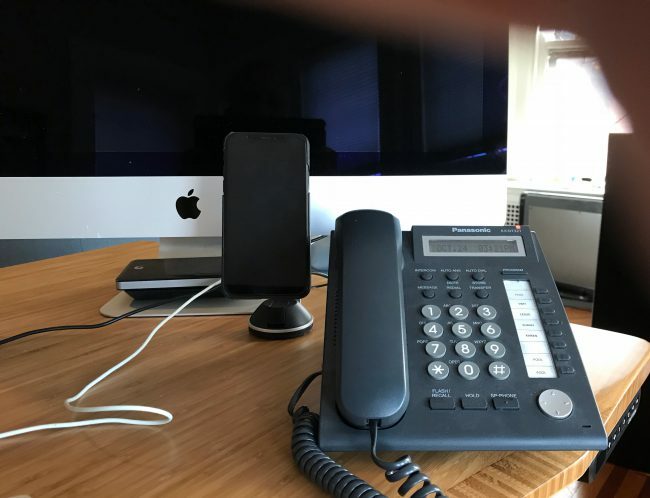 Also, it has powerful neodymium rare-earth magnets that are “100% device safe” but hold your phone in place so long as you are using a case designed for such purposes, or you have applied one of the two metal plate systems that are included in the box. More on that in a moment. What is Qi (pronounced “chee”) wireless charging anyway? : First off, it’s the global standard for smartphone wireless charging. Wireless charging functionality is finding its way into millions of devices. Wireless charging uses electromagnetic fields to safely transfer power from a transmitting source (in this case the MagicMount Charge unit) to a receiving device (built into Qi-enabled smartphones or available as an add-on via battery covers, receivers and more) for the purpose of wirelessly charging the device’s battery. In other words, the MagicMount system delivers fast charging of up to 10W to phones that are equipped with Qi wireless charging and are capable of making use of the fast charging system. It is quick. It is safe. And it is by far the most convenient way to keep your phone going all day and all night. And while the previous system I reviewed was specifically designed for use in the car, this system takes the same approach and brings it indoors. 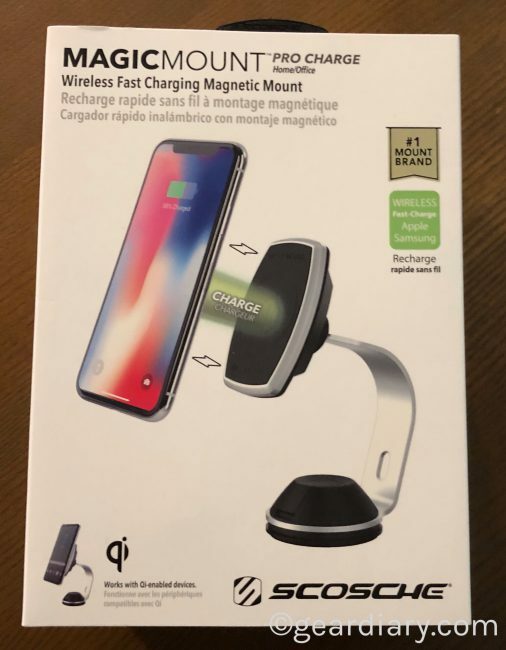 In the box you get the MagicMount Qi wireless charger, an A/C adapter (after all, this is intended for use indoors where you will have access to a wall outlet or power strip), a MagicPlate non-magnetic metal plate with adhesive and a “StickGrip suction base” that provides a strong hold to any surface and is adjustable to almost any angle so you get the best view possible. It even has a lock-nut so you can secure it in position once you determine the optimal angle. The car system comes with two ways to mount the MagicMount so you can choose whether to place it on your dash or on your windshield. 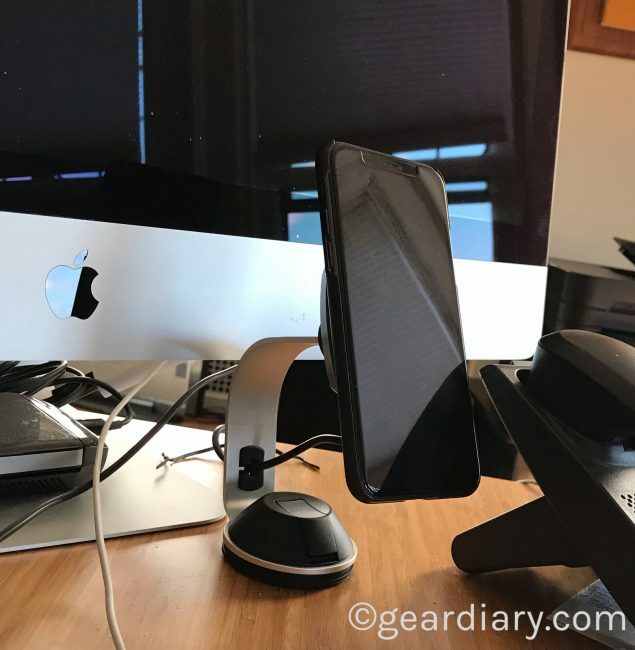 The office version of the MagicMount Pro Charge comes with a metal and plastic mount that attaches to any flat surface via suction and holds your phone at a comfortable height so you can see, and access, it when you are sitting at your desk. 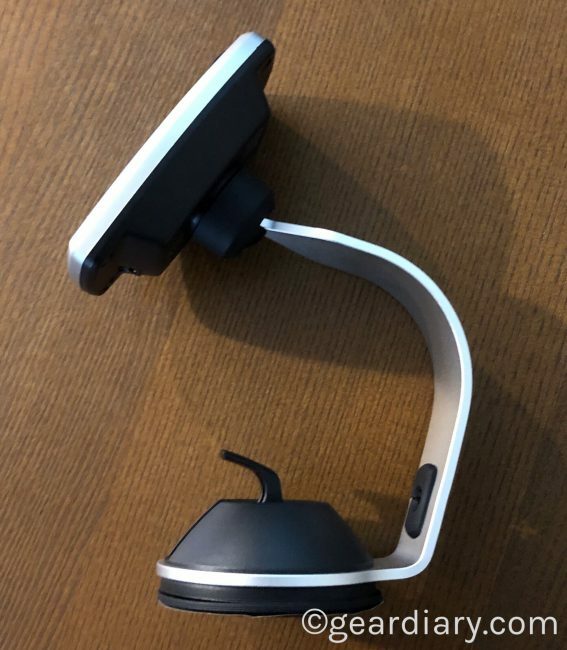 It not only raises the phone higher than the version designed for use in the car but, thanks to the metal used for its frame, the indoor version looks a bit classier. A small hole with a rubber gasket allows the power cable to pass through the stand for a clean look. Of course, you can also use this mounting option in the kitchen or anywhere else you need to not only charge but see your phone. The charger can hold your phone in either orientation so you will want to take a few minutes to consider where best to position it. 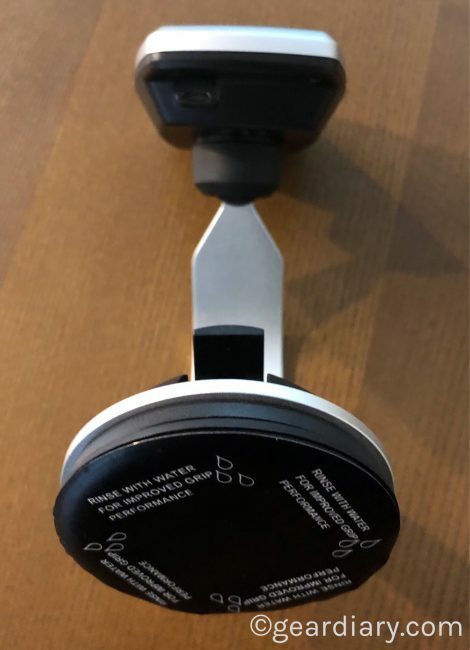 After finding the optimal location for the charging base, you remove the plastic covering the suction cup, place it in position and lock it down. After that, you can add the MagicMount charger, connect the included cable and plug it into the wall. It is that simple. 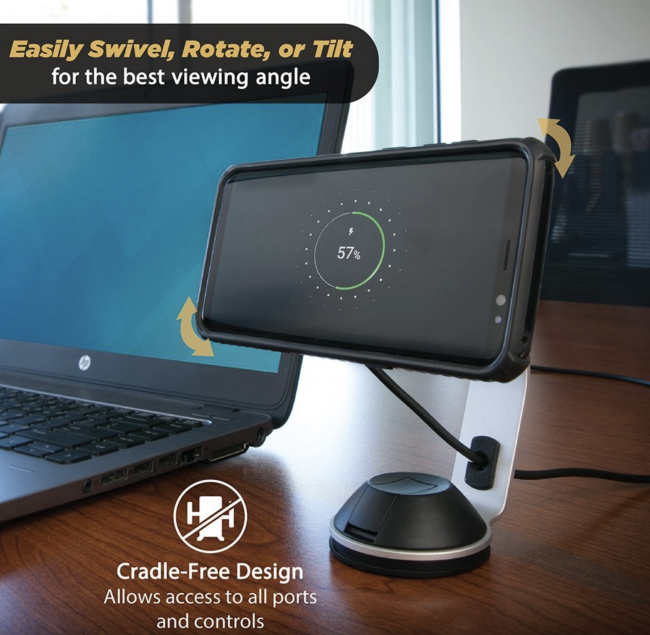 Powerful 100% Device Safe Dual Magnets: Not only do these wireless magnetic charging mounts deliver fast wireless charging, they also provide two points of magnetic contact for a solid hold via powerful, rare-earth, neodymium magnets. 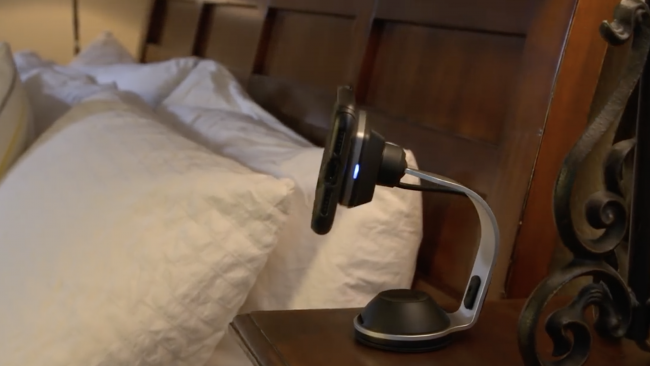 As previously mentioned, the MagicMount has magnets embedded within it so it can hold your phone without the need of a bulky, and often unreliable, cradle. Of course, magnets only work when they are brought into contact with other magnets or certain types of metal. That’s an issue since there are no phones that offer either of these right out of the box. That why Scosche also included metal plates that can adhere to the back of your phone. The company includes a template to help with positioning the plates properly on the phone. They make the installation process as simple and problem-free as possible. That, however, is only one of the options available to you. 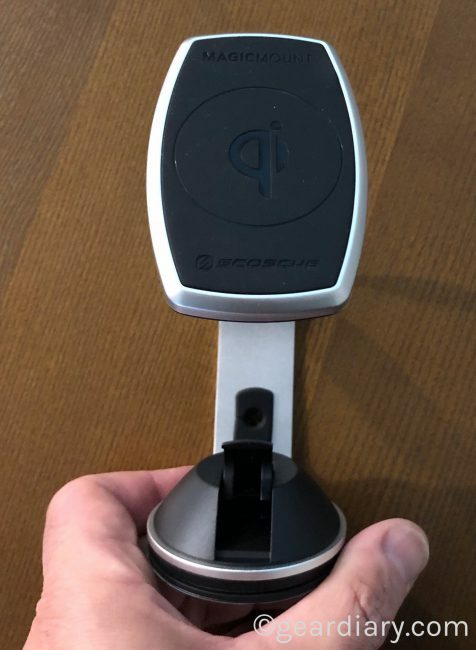 As I noted in my initial review of the model for use in your car, Scosche entered into a partnership with Speck to create a protective case that has metal plates embedded into the rear portion. 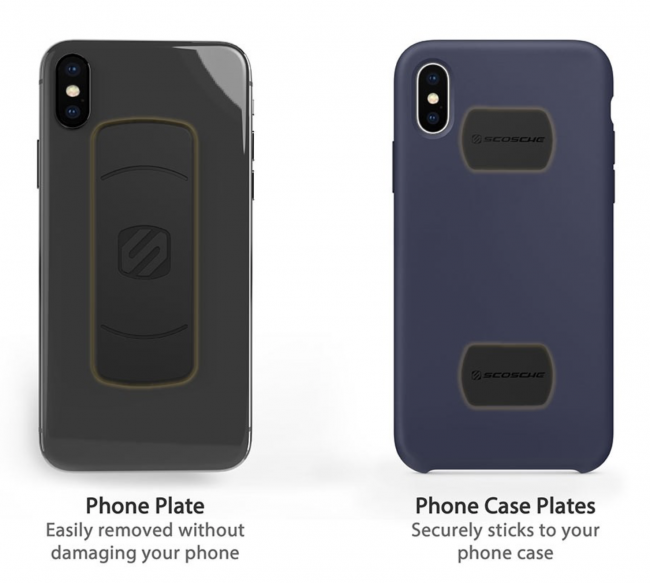 Despite looking like a standard Speck case, the addition of the metal plates does a great job of protecting your phone and lets you use the MagicMount system. There is, however, yet another option. Judie has reviewed many of the products from Pitaka. (If you have not read her various Pitaka reviews, it is worth taking a few minutes to do so.) When Judie upgraded to the new iPhone Max, she sent me the Pitaka case for the iPhone X. It is a thin and light yet surprisingly protective carbon fiber case. Better still, the metal embedded in it works well with the Scosche system. It’s the case I am currently using, and it connects to the Scosche mounts quite nicely. The result is a light case that protects my phone and lets me “hang” it in the car and, thanks to this new mount, when I am at my desk at work. 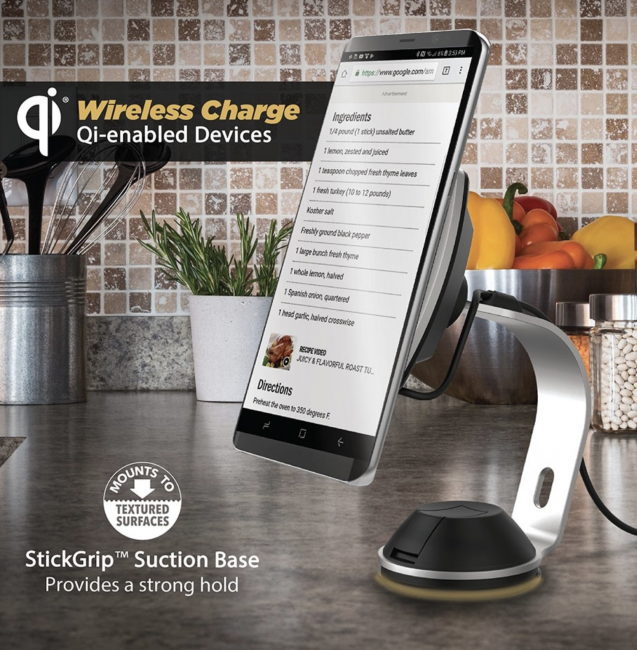 Qi Certified wireless charger is thoroughly tested by independent laboratories to ensure its safety, interoperability, compatibility and energy efficiency. A MagicPlate Placement Template for optimal non-magnetic metal plate placement to ensure maximum charging operational performance. 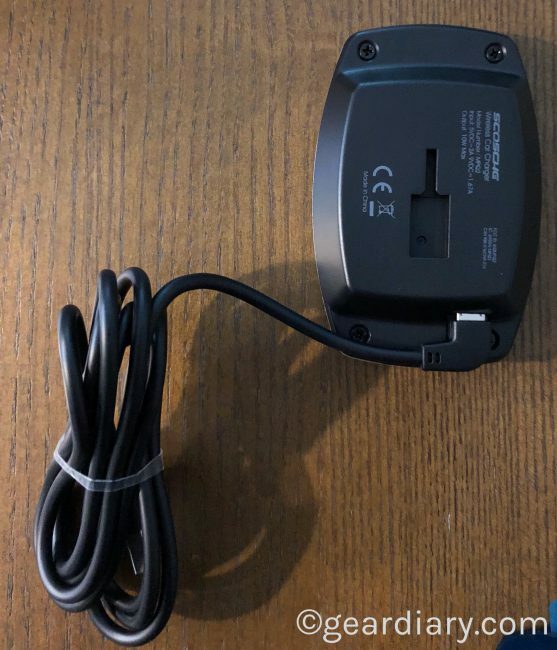 It is worth noting that, due to the placement of the camera on the Samsung Galaxy S9/S9+ this charger will not work. Those using the S9 can, however, use the MagicMount Charge 1st Generation. I love the Scosche MagicMount Pro Charge. After reviewing it, I installed it in my Audi and have used it ever since. 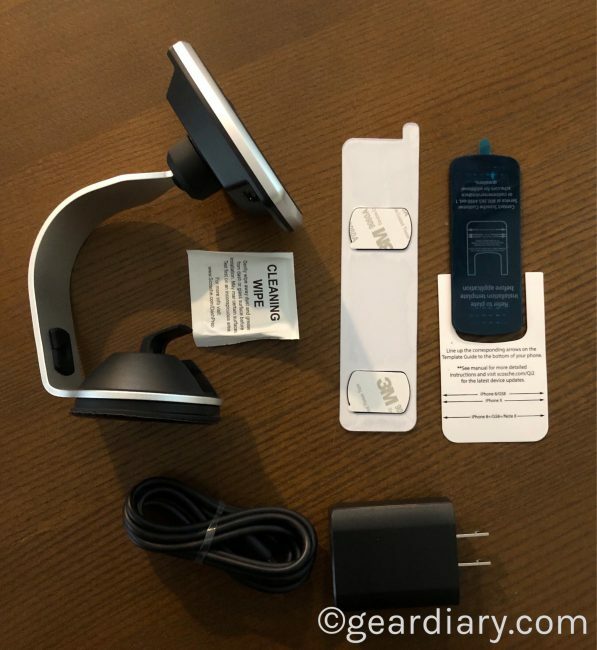 It is convenient, looks clean, holds my phone where I can see it when, for example, using it for navigation, and it charges my phone quickly. I was thrilled to learn that Scosche offers something similar that is designed for home and office use and, I wasn’t disappointed. The metallic frame of the base looks classy, the height of the base is just enough to keep the phone within view, and the charger works well. If you have a phone that offers Qi wireless charging, you owe it to yourself to check into this. It is, by far, one of the best iPhone accessories I have used. I love it and will likely pick up one or two more. After all, you can never have too many chargers, and this is one that works well, looks great and will get the job done. Check it out here.